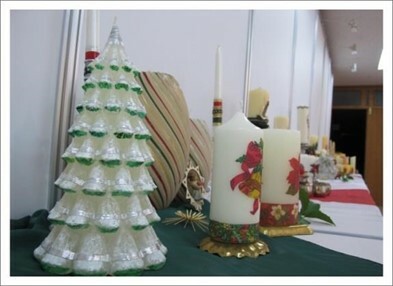 In the atmosphere of anticipation and excitement of Christmas, Daegu Priory House took the Advent season as a perfect time to display all the hidden talents of our Sisters, Sr. Barnaba Bae and Sr. Liberata Han, especially regarding candles. The latest forms of monastic art were on display for 6 days from December 6-14 at the conference room of Benedict Spirituality Center. A small Café Colloquio was offered on the first day at 3:30p.m. to celebrate the opening. 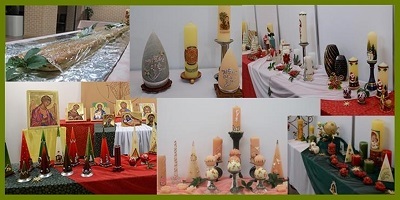 The exhibition encompassed hand-made products such as mix candles, rosaries, icons, ceramic angels and decorative articles. Even though they were not for sale, the visitors could order the items for 2014. A large number of rosaries were requested. They were all made by the Daegu Priory Planning Team and the proceeds will be donated to mission fields.